chantalrialland.com : "La vie notre meilleure amie"
Psychogenealogy: a way to improve your life. 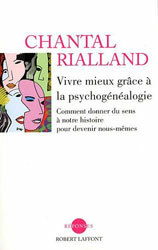 French Title: "Vivre mieux grâce à la psychogénéalogie"
Noted French psychologist Chantal Rialland – an expert in the field of Psychogenealogy takes readers on a journey into their every day life. In order to heal from the baggage of our past and to reach our full potential, we have to free ourselves from the shackles that our family and our education have passed on to us. We have to go beyond those hurdles so that we don't feel victimized anymore. This is the basic function of Psychogenealogy and how it can help us. How to experience a rebirth? How to develop and reach a harmony with all our psychological aspects. How to blossom personally, emotionally, professionally, and within our family? How to better communicate with others? This book offers an answer to all these questions and provides solutions which will help us to utilize and maximize in a positive way all the baggage that we have inherited from our family history.